Abracadabra! A stunning new slot game from Novomatic has magically appeared at Novomatic casinos! This is an incredible new release from Novomatic. 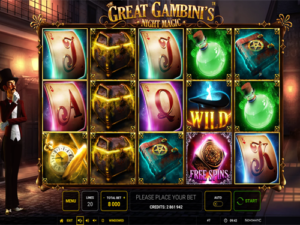 It’s got all the charm of a typical Novomatic slot game, with all the magic of The Great Gambini. Gambini is an excellent magician, whose trickery is ready to pay you big wins. The slot has a vintage, Victorian feel to it. The 5 reels of this video slot are standing on the street where The Great Gambini practises his night magic. The sun has set and the street lamps light up the cobbled pathway. The magician himself is standing on the left-hand side of the reels. He’s wearing a well-cut tuxedo, complete with red tailcoat, a red bowtie and a top hat. His gloved hands are poised, ready to perform a magic trick at a moment’s notice! As you play this high-paying video slot, magic can happen at any moment! The Great Gambini is used to putting on a good show. He will often perform his signature magic tricks which will give you bonus features! Along with bonus features, you can win Free Spins! You can play this slot for free and for real money at Novomatic casinos. Novomatic slot games are notorious for being high-quality and extremely entertaining! This new video slot is no different. In fact, it goes beyond normal Novomatic standards and adds a touch of magic! Every great magician knows how to perform card tricks. In the Great Gambini's Novomatic casino slots the Great Gambini has had several decks of cards made specifically for him! They’re designed in his signature style and only the highest cards in the deck are on the reels. The Jack and Queen are the lowest-paying symbols. The King and Ace give higher payouts. More valuable than the cards are the magical artefacts! There’s an enchanted, golden stopwatch and a book of magic. There’s also a magic potion, a plasma globe and the magician’s chest. The chest can award a payout for just 2 or more matches, and so can the Wild symbol. The Wild symbol is The Great Gambini’s top hat. The remaining symbols can award payouts for 3 or more matches. Payouts are awarded when enough matching symbols are positioned in winning combinations! A winning combination is one that starts on the leftmost reel and follows a payline on successive reels. There are 20 paylines in total. The Wild symbol can substitute in a ‘gap’ of a winning combination for any symbol but not for the Free Spins symbol. Gambini allows you to collect or gamble your wins in his great game! This Novomatic magician has a lot of tricks up his sleeve! The first is a guillotine trick. This bonus feature sees a guillotine cut across the reels after a losing spin. After guillotine falls, you’ll be left with a winning combination of symbols! The Great Gambini can also perform levitation tricks. After a losing spin, the magician may use his magic to make some symbols float out of sight. In their place, he will add new symbols that will result in winning combinations! Also, after a losing spin, The Great Gambini might decide to magically rearrange the reel order to give you win. Lastly, the magician has the power to quickly move one or more symbols, in any direction, to make a winning combination and pay you a win! The Free Spins symbol in The Great Gambini Night Magic is the most magical of all. It can’t be replaced by the Wild symbol. You get 5 Free Spins for 3 Free Spins symbols. You get 10 Free Spins for 4 Free Spins symbols. 15 Free Spins are all yours when you get 5 Free Spins symbols on the reels! The Great Gambini works his night magic during the Free Spins, too. For every spin you have, the magician will show you a particular symbol and a particular reel. If that symbol lands on the chosen reel, the symbol will expand to cover every position on that reel and the reel(s) to the left of it. This magical Free Spins bonus can award some truly tremendous wins!